Extreame Savings Item! Save 42% on the 200W Car Power Inverter DC 12V to AC 110V Converter with Smart 4 USB Ports Adapter 2 AC Outlets Sockets Charger (Black) by LEICESTERCN at Lazaranda Dallas. MPN: C100003. Hurry! Limited time offer. Offer valid only while supplies last. √ DC to AC Converter- Premium 200w car power inverters with 4 USB ports and 2 AC outlets. 4 USB ports (Max 6.2A total) & 2 AC outlets great for charging smartphones, laptop, tablets, GPS units, TV, battery chargers, camping equipment and mobile office equipment. √ Mufti-Protection- built-in 15A fuse, safe charging design provides protection against, overheating, under and over voltage charging, short circuiting, overloads, and overcharging. Integrated very silent cooling fan helps reduce heat and prevents shortages. √ Compact Size- 2.6-foot cigarette lighter plug convenient for backseat use. Compact design perfect for you to use inverter on the road,campsites or anywhere that power is needed. √ LCD Digital Screen- showing 4 USB ports charging current (total), and input voltage. Durable metal housing provides advanced protection from drops and bumps. 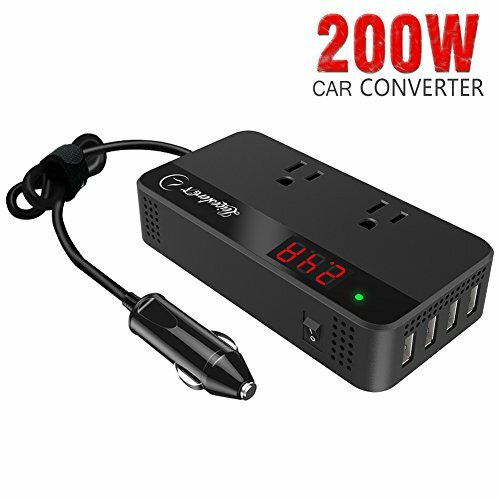 √ Individual Power Switch- Power saving and safe, the 200W converter has an extra ON/OFF switch for 4 USB charger, which is very safety for use and car battery protector. [Special Offer] Save 5% each on car inverter when you purchase 2 or more. If you have any questions about this product by LEICESTERCN, contact us by completing and submitting the form below. If you are looking for a specif part number, please include it with your message.